It's winter, and for me that means drier skin. So I was happy to review Suave Professionals® Moroccan Infusion Body Care line — specifically the Body Lotion and the Dry Body Oil. I've been hearing about argan oil all over the place lately — have you? It's supposed to be fabulous for nourishing and moisturizing and chock full of nutrients and antioxidants. It's made from the nut of the argan tree that grows in Morocco, which is kind of far from Seattle, by which I mean I hadn't yet had a chance to give it a try. So I love that Suave's brought a premium ingredient to the mainstream, since this new body care line is infused with authentic Moroccan argan oil. The Suave Professionals® Moroccan Infusion Body Lotion was a nice, hydrating lotion with a pleasant, Moroccan-ish scent. What does Morocco smell like? As established, I have no idea. But this somehow evoked the idea to me! The lotion absorbed quickly and felt nice on my hands. Even though it was substantial, it wasn't greasy, and the moisturizing lasted nicely even through my next hand washing. than my intense hand tendons would suggest. But, even more, I have to say I really loved the Suave Professionals® Moroccan Infusion Dry Body Oil Spray. I didn't know I'd enjoy a spray oil (or any kind of liquid oil), but I really did. It spritzed out evenly from the spray bottle without getting on everything else, and it absorbed quickly into my skin with a nice sheen but no extra grease. See — sheen, but it absorbs quickly and feels so nice! But, seriously, do I have man hands? I really enjoyed smoothing it over all my skin after my shower. It had a lighter scent than the lotion, which I appreciated. It felt luxurious to hydrate like that during the winter — a spa-like experience. At any rate, I've always been pleased at how affordable Suave makes its products, and the way they can make rich-feeling products at a reasonable price point. I'll continue to enjoy the lotion for my winter-battered hands, and the oil spray to remoisten after a shower and my very occasional shaves! For the first time, Suave® Body Care is launching products in the Suave Professionals® line, offering women everywhere access to premium quality products with the finest skincare ingredients. The new premium range leaves skin looking and feeling beautifully silky and radiant and is clinically proven to moisturize as well as Moroccanoil®1. They feature a light, luxurious fragrance and are infused with authentic Moroccan argan oil, a lightweight miracle oil. The Suave Professionals® Moroccan Infusion Body Care line includes Body Lotion, a daily moisturizer that absorbs quickly for up to 24 hours of non-greasy hydration, and Dry Body Oil Spray, a non-greasy formula that absorbs instantly, locking in long-lasting moisture. The Dry Body Oil Spray is perfect for special occasions such as adding radiant sheen to legs. With a light, luxurious fragrance, these premium products create beautifully silky, radiant skin. Find more information about the Suave Professionals® Moroccan Infusion Body Care products at www.Facebook.com/SuaveBeauty. Visit to get tips for radiant skin and style advice from celebrity stylist Brad Goreski, and to enter the "Radiant Wishes" sweepstakes for a chance to win Suave Professionals® Moroccan Infusion products, a spa day, or a trip to Los Angeles. 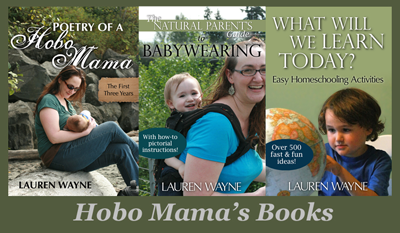 Be sure to visit the Suave Professionals® brand page on BlogHer.com where you can read other bloggers' posts! 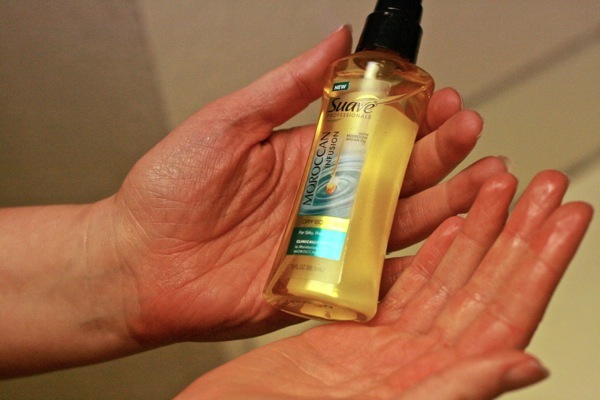 Disclosure: This review is sponsored by BlogHer and Suave. If I don't like a product, I won't be recommending it to you. See my full disclosure policy here. The Dry Body Oil Spray sounds intriguing! I would love to try that. I would like to try the body oil spray. Sounds great! I'd love to try the Dry Body Oil Spray. The Body Lotion would be my first pick! The lotion sounds terrific....would like to try some. I'm not a lotion fan, but I'd like to try the oil spray! I want to try the Moroccan Infusion Dry Body Oil Spray most! I like the body lotion. I would love to try the Suave Professionals Moroccan Infusion Body lotion because my hands are so dry after washing them constantly at work. I work as a health care professional. I would like to try the Moroccan Infusion Body Lotion. I would like to try the Moroccan Infusion Shine Shampoo & Conditioner! Hello, I would love to try the Suave ® Moroccan Infusion Lotion, my skin needs it. Thanks for a great giveaway! I want to try the try the Suave ® Moroccan Infusion Lotion for my dry skin. I'd like the dry oil spray the best! I would like to try the Moroccan Infusion Body Lotion-the older I get, the flakier I get! 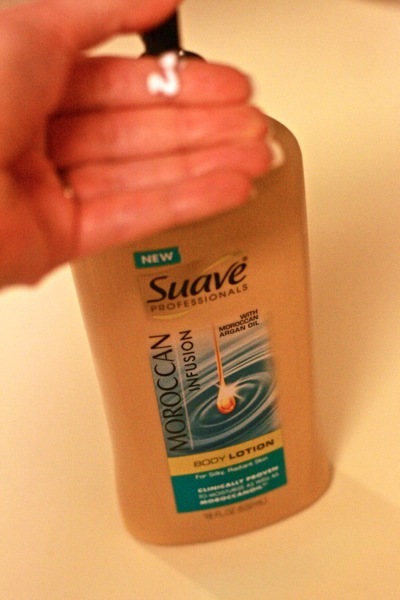 Suave Professionals® Moroccan Infusion Body Lotion - my skin is so dry! I want to try the dry body oil spray. I would love to try the Suave Moroccan Infusion Body Lotion! I would love to try the Dry Body Oil Spray. I hope it works as well as the body lotion to moisturize. The dry body oil looks great! Thanks for hosting! Dry Body Oil Spray! I'm a big fan of the quick absorb factor. I would like to try the Dry Body Oil Spray. I hate greasy feeling skin. I love the shampoo and conditioner...I'd love to try the lotion too!! I like to try the Moroccan Infusion lotion...sounds nice. Id love to try the dry body oil. i'd love to see how it works on dry winter skin! I would love to try the Moroccan Infusion Dry Body Oil Spray the most, I have trouble with dry skin on my legs and knees and this sounds wonderful. I am dying to try the Dry Body Oil Spray! I would like the Dry Body Oil Spray. I would like to try the dry body oil. I have never tried anything like it! I would love to try the body lotion because my hands are always so dry! I'm dying to try this. I have such a problem with dry skin and i'm looking for the perfect lotion, spray, etc to help!! I'd like to try The Dry Body Oil Spray! I want to try the Moroccan Infusion Dry Body Oil Spray.